Not-a-pe-ka-gon was the Native American name given to the Ludington area and translates as "heads on sticks." The name refers to a battle between the Ottawa and Mascouten Indians in the 17th century that raged along the river toward Lake Michigan. The heads of the defeated Mascoutens were placed on sticks as a warning to all. Later a bluff overlooking the lake and river was the site of the 1675 death of Fr. Jacques Marquette, a Jesuit missionary and explorer. When the first settlers of European descent arrived, they gave the name of Pere Marquette to their village, lake, and river in honor of the fallen missionary. Eventually renamed after lumber baron James Ludington, the community became a bustling maritime port and the home of the largest car ferry fleet in the world. David K. Petersen is a local historian and collector of historical images. 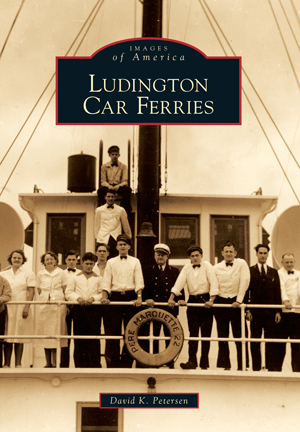 He has published two pictorial books of the Pere Marquette car ferries based on the photography of Erhardt Peters and currently writes a weekly history column for the Ludington Daily News. Petersen has selected many unique images from his collection to illustrate the maritime history of Ludington from its humble beginnings to an important port of call.